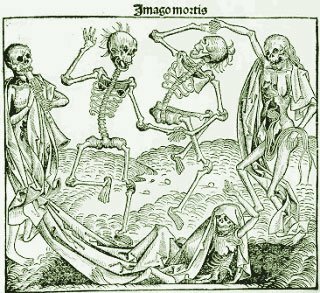 Here is my all-time favorite Halloween song…Danse Macabre. Download and listen while I share with you a spooky tale. Those things that go bump in the night…I now know what they are…Nocturnal Monkbots. I’ve never liked being scared. I hate that feeling of terror that surrounds you when you’re alone at night. As for modern horror flicks, I’ve given them a try…only to meet with unpleasant results. For days after watching “28 Days Later,” I couldn’t rest. The scene where Jim enters the church and unknowingly awakens the sleeping infected priest is one of the scariest moments I’ve ever seen. And I’ll never forgive my brother Ben for telling me I just HAD to watch “The Ring,” which I did…alone…on a Friday night…and felt my chest constrict with fear after seeing the cursed VHS tape footage. The thought of it disturbs me to this day. I guess one of the most recent movie scenes that made my heart race with fear was in “The Village,” where blind Ivy is in the woods…in broad daylight…and she hears “those we do not speak of”…and it’s standing right beside her. Honestly…when I saw that in the theatre…I thought I was going to vomit because it scared me so bad. I went to find videos of each of these movie scene to put in this post…but I got so creeped out watching clip after clip…searching for the right one…that I decided not to post. Instead, I opted for my favorite creepy music video. The Squirrel Nut Zippers have been around quite awhile. “The Ghost of Stephen Foster” (which you can download here as an mp3) was released in 1998 on their album, Perennial Favorites. They offer the same kind of charm as The Ditty Bops…but with a bit more demented style. Since scary movies do more to upset me than entertainment…I do try to stay away from them. One of the reasons is that I can never fall asleep after watching a horror flick. It’s not like I’m a good sleeper anyway. I’ve always been very fitful when it comes to my nightly visit from the Sandman. Not only do I talk in my sleep…I walk in my sleep…and I dream disturbing dreams fairly regularly. One of my reoccurring nightmares is simply a man…standing outside my window…watching my house. Every night I look outside my window and he is standing a few feet closer…staring…watching. Until one night, I look out the window and he’s right up against the glass…looking in…staring at me with an empty gaze….this is where I always wake up…terrified. I know all too well what a night terror is (see above picture). More times than I care to admit, I’ve woken up from some horrid dream…my heart racing…I’m literally paralyzed with fear…can’t move at all…and my chest feels compressed…like it’s under some horribly heavy weight. One of these dreams was so vivid…that I wrote about it. The work isn’t my best (written years ago)…and those who have read it before don’t like the ending…but I thought I’d share it with you anyway. I hope it gives you chills on this All Hallow’s Eve. Honesty has never been a trait of mine nor of my foremothers’. But passion has. And for this we have suffered. For this we have lost our lives to a curse that began four generations ago. A curse that now suffocates me and threatens my beautiful daughter. I know I must tell her of her fate, but how do you tell someone that you know when they will die? How much of their life do you let them live in peace before you block out all hope and sunlight? “Mom, I heard you this morning. Did you have another bad night?” asked Raye. She was buttering a piece of toast as Lana entered the kitchen. Still facing the counter, under the auspices of fixing herself a piece of toast, Lana’s face cringed. “Oh really? What did I say?” She tried to sound nonchalant. “I couldn’t really tell, except for one word. Sounded like Maestro. You conducting a symphony in your sleep?” Raye smiled. They both laughed. Lana loved the sound of her daughter’s laughter more than anything in the world. But she had no more drunk it in before that same sound plunged her heart into sadness. She knew how fleeting such laughter was. “Oh, dang.” Raye glanced at the clock on the stove, took one last gulp of milk, grabbed her books, and bolted through the side door. “Love ya, Ma,” she called over her shoulder as she sprinted toward the bus stop. Lana had never gotten used to how quiet the house was when Raye wasn’t around. Too quiet to drown out her thoughts. So, as was her habit, she made her way to the television in her bedroom and clicked it on for some background noise while she got ready for the day. Standing in front of the bathroom mirror, Lana stared at the woman across from her. She had been a beauty once, but her nearly 42 years had betrayed her. Worry does that. It festers until youth and zeal and hope are wiped from one’s heart, which, in turn, wipes them from one’s countenance. And the fact that she had been waking at 2 a.m. every night for a month now just made matters worse. She stepped into the warm shower, but cold chills still enveloped her body as she thought about the morning hour ritual that was keeping her from rest. At the first strike of the 2 o’clock hour from the grandfather clock in the hall, Lana’s eyes would open to her darkened room with its even darker ceiling. As she would lay silent, praying in preparation for what was to come next, beads of sweat would run from her brow, down her temples, through her hair, and into her pillow. Then–whether by magic or imagination, she was not sure which for the event seemed both real and surreal–the ceiling would transform. The darkness would gather into patches of shadows that were cast by thousands of black leaves, clinging to black branches. Her room would dissolve into a bare wood floor bordered by gnarled limbs spaced just far apart to somewhat see through but close enough to imprison her. And through the walls of knobs and knots she could see him, peering at her as he floated ‘round and ‘round her tree tower cell. An obnoxiously loud announcer coming from the television set jolted Lana free from her thoughts. She finished bathing, dried off, and pulled on her favorite pair of jeans, a flannel shirt, and a well-worn pair of work boots. Today was clay day. Once a week, she would drive 30 miles outside of town to a pasture–long since forgotten by most–to dig up clay to use for her work. She had been sculpting and throwing pottery for more than 15 years and had made quite a name for herself. Her work was selling well at local gift shops, flea markets, and festivals so she could have easily afforded to buy what she needed in town instead of making the weekly trek to the pasture to dig for clay. But the effort was a labor of love. She looked forward to the quiet drive and to visiting the place where she had grown up. The place where she had spent time with her mother before she died. The pasture was on 40-acres that had been in her family for generations, but she had been one of only a handful of visitors over the past decade or so. She and her mother had lived in the small cabin built after the fire that destroyed the home of her great-great-grandmother, Rosalie. The cabin was situated just off the main road and was backed by the small pasture. Beyond that was the 30-some-odd acres of woods that had grown up around where the old homestead used to be. As Lana drove her Jeep up to the cabin, an older woman came out onto the front porch and waved. Inside the cabin, Gertie had fresh cookies waiting on the table and the water kettle was just starting to whistle. She put the kettle, two worn mugs, a jar of honey, a spoon, and two bags of Earl Grey tea on a serving tray and carried it to the table as Lana sat down. “I know how you are, but how’s Raye?” Gertie asked. Lana put a tea bag in her cup to steep. She couldn’t help but think of the famous quote from Eleanor Roosevelt about a woman being like a tea bag…you never know how strong she is until she gets into hot water. She felt like the weakest tea bag ever. Tonight I have stopped the hall clock in hopes that my rest will not be interrupted. However, I know that, in truth, I am waking before the first sound is ever issued from the timepiece. He is waking me, just as he did my mother, grandmother, great-grandmother, and Rosalie. Just as he will my Raye. I am less than a week from the age of death in my family and know that the time has come to let Raye know about my destiny…her destiny. The clock sat quiet the entire evening. No ticking. No chiming. But just as Lana began to feel the heaviness of her lids and the soothing draw of slumber, her eyes flew open and the stillness of the night was rudely interrupted with the striking of the 2 o’clock hour from the grandfather clock. The shadows gathered into pockets on her ceiling and the leaves and branches formed from the pitch. Through her cell walls she saw him circling, watching her. She was dizzy from his motion and wanted to be relieved when he stopped outside the wall at the foot of her bed, but she knew his stopping was not a good thing. Then, like the shadows that cowered under the black leaves, the knotted limbs forming her cell withdrew into one another and Maestoso moved forward into the room. He hovered just beyond her bed, in all his vile glory. He was as pale as the ghostly skin clinging to the underbelly of some wretched creature from the deepest depth of the sea, where no sunlight ever dares reach. His long hair and robes whipped around him like smudged ribbons of black ink. But his eyes were what Lana could bear the least. Red upon red, as if two burning pools of blood cast a gaze on her. With his every look, he seared into her mind, into her heart. The pain was tortuous and Lana’s only defense was to look away. And in that brief release from the agony of his stare, Lana could see beyond the creature and out into the night. There, out from the treetops she saw her pasture and Gertie’s cabin. “No!” Lana screamed as she sat straight up in bed. Her room was back to normal and the breaking of daylight was peeking through the window sheers. Lana quickly wiped the sweat from her brow and smoothed her soaked hair from her face as she ran to unlock the door. “Good morning.” Even she heard the absurdity of her words. As soon as Raye’s bus had pulled away from the stop, Lana jumped in the Jeep and headed for the land. The drive seemed to take forever, but when she finally got there, she wheeled off the road, passed the cabin, drove across the pasture, and stopped where the thick growth of trees began. She had never liked going into the woods and therefore had never walked more than a few feet into the brush. The overgrowth had always served as a buffer between her good memories of the land and the bad. But today Lana knew she had to venture much farther into the trees. She got out of the Jeep, swallowed hard, and began walking. After about 10 minutes, she came to a clearing. A rusted iron fence told her she had reached the site where Rosalie’s house once stood. The fire had destroyed the home down to its foundation 84 years earlier but, despite the green woods surrounding the fence, the yard inside was still as desolate as it was after the fire. What little grass left was brown and dry. Stranger yet was what sprouted from the center of the old, cracked foundation. Where the house once stood was a dead oak tree that looked to have a couple hundred years of growth. She heard a rustling behind her and turned with a start only to see Gertie emerge from the brush. “What are you doing way out here?” the old woman asked. “Gert, I’ve seen this tree. Hell, I’ve been in this tree.” Lana pointed to the dead oak. Lana hesitated. She had vowed after her mother’s death that she wouldn’t put Gert through any more trauma, but that was before she knew her fate. “Lana, tell me about that tree,” Gert demanded. Lana knew the words to be truer than Gert had realized. She knew Thomas was close by, and she quickly followed her old friend back to the Jeep in silence, knowing that–like it or not–she would be returning to this place–to him–in the wee morning hours. Lana arrived back at home and went directly to her studio. She wanted to finish as many works as possible before Friday evening. It was one more thing she could do for Raye, provide for her. She worked furiously until 3:30 p.m., when she knew Raye would be home. Then she quickly cleaned up and went inside to hear about her daughter’s day. But when she entered the house, she knew something was wrong, even before she heard sobbing coming from Raye’s bedroom. “Honey, what’s the matter?” Lana rushed to her daughter’s side. “Mr. Pepper was in an accident last night.” Raye could barely form her words. Lord have mercy. Lana thought she would vomit. Raye sobbed even harder, unable to control herself. Maestoso has revealed himself to me in spirit and to Raye in the flesh. I know he wants her, but I am sickened at the thought of him having her. Surely it is better that she die like me than give him what he wants. Yet I struggle within myself to think that maybe she could bear his physical form and secure a long life for herself, even if it isn’t the happiest of lives. I have accepted my fate, but for Raye I cannot accept either fate that awaits her. Tonight I must face him and beg for his mercy on my daughter. But for the first time since the 2 a.m. visits began, the clock did not chime the early morning hour. When Lana opened her eyes on Thursday morning, it was to the daylight flooding into her room. She had slept through the night, but she felt far from rested. Her thoughts were on Raye. She ran to her daughter’s room, but the girl was nowhere to be found. She must have gone to school without waking me. Lana looked at the clock. It was 11 a.m. How could she have slept so long when so little time was left to help Raye? She quickly dressed, taking special care with her appearance. Then she jumped in the Jeep and headed for Raye’s school. “Excuse me, where can I find Mr. Maestoso?” Lana greeted the school secretary with a smile, trying not to wince at the sound of the bitter name. The hallways were quiet, as the students spent their lunchtime away from the classrooms. Lana’s breathing and heartbeat sped up as she entered the room. She was surprised that she was able to keep her composure. And then she saw him sitting at the teacher’s desk and the pain surged over her like a tidal wave. He was a young, dark-haired man, furiously scribbling in a leather-bound journal. Because of the intense ache in her head, she could barely focus on him so she lowered her eyes and thought of Raye. The man didn’t look up or stop his scribbling. “Daughter of Rosalie, you had your chance to break the curse when you were pure, but you chose to be with your precious Charles. I have no interest in you now. I want no woman that has been had by another.” His pen was now tearing through the pages in the journal. “But I didn’t know I had a choice.” Lana wished in vain for some amount of pity from the wretch. She hesitated a moment too long, causing him to finally put down his pen and looked up at her. She raised her gaze to meet his red-rimmed eyes. They bore into Lana like the flames had two nights earlier. She gripped a nearby desk to steady herself, as the pain grew more intense. Then Maestoso’s human form floated over the desk and pressed against her withering body. “I can’t. Her heart is hers to give. I will not let her actions be dictated by fear.” Lana fell to her knees. Lana wanted to spit on him. She wanted to tear him apart, but she couldn’t. She could barely stumble across the room to leave. In the hallway, Lana waited for Raye. Her mind raced as she thought of what this monster wanted from her daughter. There was nothing she could do to stop him, but what if she could make the matter easier for Raye? If he forced himself on her that would be worse than if she welcomed it…or at least prepared for it. The thought revolted against Lana’s every instinct, but she couldn’t stop thinking that it may be her daughter’s only hope. Just then the bell sounded to end the lunch hour and hordes of students flooded the hall. Lana spotted Raye, walking with a handsome young boy. As they approached, Lana reached for her daughter’s arm and pulled her against the wall. “Raye, I must speak with you.” Lana’s face was still pale from the encounter with the manifestation. Lana tried to call to Raye and David but the couple disappeared into the crowded hallway. It didn’t matter anyway. She wouldn’t have known what to say even if they had stopped to listen. She couldn’t believe what she had just told to her precious daughter to do. “He’s driving me mad,” Lana whispered. And as the last straggling students raced down the hall to beat the tardy bell, Lana ran from the school. In her studio, Lana thought about what had happened at the school. She threw pot after pot, trying to work out a solution by working the clay. But no solution was good enough. And after hours of work all she had to show was a table covered with greenware. She cleaned her wheel and wiped down the studio. She would make no more pieces. Tomorrow she would fire up the kiln for the last time. But tonight, no more fabrication, I have to face the fire with Raye. I have to tell her everything. Raye was sitting on her bed when Lana entered the girl’s room. “Honey, we need to talk.” Lana sat down next to her daughter. Raye crossed her arms and leaned back. She tried not to blink, as it would unleash a floodgate of tears. “My substitute teacher?” Raye gave a crazed expression. Raye sat in stunned silence. Lana turned around. Raye gave a weak smile. Lana continued, “Well, Rosalie and her parents worked the 40 acres as tenant farmers on an estate that measured at least five times that size. Her father, Jesse, dreamed of buying the acreage and being able to keep all of the earnings it yielded. But Jesse grew sick and the family fell on hard times. Suitors came to woo Rosalie, but her attentions were focused on helping her mother work the farm and secure ownership of the land. “But Thomas never got over Rosalie, did he?” Raye asked. “And when did Rosalie die, Mom?” Raye could barely force the question. “That’s horrible,” Raye sobbed harder. Raye fell asleep in my arms tonight after crying for hours. I told her about everything: Thomas, the tree, and the morning terrors. Our time is so short and I hate that that monster is taking our last precious hours from us. But I am so glad that she knows. Hers was the hardest good-bye to say, even after saying good-bye to my mother, to Gertie, and to my dear Charles. I am so proud of Raye and pray she finds a way to break this curse and finds a long life filled with happiness. At 2 a.m. the clock struck and the ceiling was scattered with leaves. As Lana opened her eyes and saw Maestoso circling she began to laugh. “You have nothing to laugh at, daughter of Rosalie!” Maestoso’s voice echoed in her mind and the phantom entered her cell. As much as Lana could tell, the monster seemed irritated by her words. “Enough!” And with the wave of his arm the leaves turned to ceiling; the limbs turned to walls; and Lana opened her eyes to the morning light. She looked over at the three framed photos she kept on the nightstand: one picture of her mother and Gertie, one of Charles, and one of Raye. She smiled as she thought of her loved ones. No more secrets. Her good-byes had been said. All that was left was to finish her work in the studio. Then she noticed that her journal was missing and in its place was a note from Raye. It read, “I love you, Mom. I debated staying home today but decided it would be too painful, plus I know you will want to finish things in the studio. I borrowed your journal. I didn’t think you’d mind. I’ll bring it home with me at 3:30. Everything’s going to be okay. Thanks for telling me.” Lana smiled, got dressed, put the note in her hip pocket, and went to work. She fired all of the pieces she had thrown the day before. Her work hadn’t pleased her this much in years. She loved the glazes and texture of finished pieces. She loved that she would live on through her work…and through her daughter. At noon Gertie knocked on the door of the studio. She came with a homemade lunch and to visit with her friend until Raye came home. Tonight was my last with Raye. We had so much fun, laughing at old memories, looking at old pictures. I cracked open the bottle of Dom Perignon I had been saving and shared it with my daughter. Our time together was sweet, although far too short, but I go to sleep tonight with every confidence that my Raye will find a way to stop this…to claim for herself a new destiny. The effect of the champagne took hold of Lana, who fell asleep with her daughter lying next to her, holding her hand. But at the 2 o’clock hour, Lana opened her eyes to find herself alone in her bed, atop the tree tower, and surrounded by fire. As the flames burned closer and closer to Lana, Maestoso circled faster around her, hissing, spitting, and laughing. Back in Lana’s real bedroom, Raye couldn’t wake her mother. She reached over to shake her but Lana’s skin was too hot for Raye to touch. Raye grabbed her mother’s cell phone and car keys and ran to the Jeep. She had to get to the land. Gertie met Raye as the Jeep spun into the drive. Gertie jumped in the car and they sped across the pasture. The car had barely rolled to a stop when both women jumped out and plunged into the dark woods. But before Lana could respond, she saw Raye and Gertie come from woods into the clearing. Maestoso spun around to see the girl. “I am,” Raye called back. He lifted his hands and Raye rose into the air. Lana fought her urge to argue. This is Raye’s decision to make. “Wait!” she tried to yell, but it was too late. She was back in her room, 30 miles from Raye and too weak to stand on her own. She fell to the floor and was reaching for the phone to call 911 when her bedroom door burst open and David ran in. David helped her to his car and they broke all speed limits racing to the land, although to Lana the drive seemed like an eternity. When they got there, they pulled into the drive of the cabin as the sun was coming up over the woods. Gertie was on the porch, waving for them to stop. “Do you have Raye?” Lana yelled from the car. Lana took a deep breath, more frightened than any of Maestoso’s visits had made her. David helped her from the car and they followed Gertie inside to the front bedroom. There on the bed was Raye, pale and sweaty, lying in the morning sunshine that beamed through the windows. “I’m here, babe.” The handsome young man took her hand and gently kissed it. Almost immediately, Raye fell asleep, and David led Lana to the kitchen table. Gertie put a kettle of water on to boil and joined them. “David, what happened?” Lana’s thoughts were racing. The kettle began to softly whistle and, for the first time, Lana realized it was a new day. A new day because of her daughter’s sacrifice. Gertie read the look on Lana’s face as she poured the hot water into three mugs. Then she walked over and put her hand on Lana’s cheek. Lana knew Gertie was right. A year has passed and I still can’t look at my daughter without thinking of what she did to save me. I will be 43 in a week and I owe it all to Raye, the strongest woman I know. And David has become the man that Thomas never could be. He loves a woman who was had by another man and he loves a child sired by another man. Baby Hope is soon to be three months old and is a living testament to her mother’s bravery, devotion, and sacrifice. A sacrifice that was rewarded with a beautiful daughter, who will know truth, strength, and courage, and who will, like her mothers before her, fill her heart with passion.